How did these hiking courses come about? Along with my vast and deep love for hiking, I'm a classroom teacher who fell in love with online learning. My masters degree in teaching gives me solid teaching technique, and my 3 science degrees provide deep content in biological sciences. Add in 2+ decades of teaching, and you could call me a seasoned teaching veteran (battle scars and all). Couple this background with 45+ years of hiking, and what do you get? Well designed, entertaining online hiking courses built around teaching best practices and rock solid trail experience! To say that I love creating hiking classes that everyone can access and enjoy, anywhere and anytime on the planet, is a huge understatement. Such freedom to learn can only be matched by the freedom of shouldering your pack and heading down a hiking trail, wouldn't you agree? Use these unique on line convenient hiking courses to sharpen any hiking “career goals” you might have. Just click the course name for a complete course description! community oriented courses: everyone comes together for weekly phone chats and proceeds through the course at roughly the same pace. Please feel free to use the contact form below to send me any hiking course questions you have. I strive to be clear in my descriptions, but perhaps I missed something that's important to you. I'm also open to suggestions for courses. If you're having trouble finding information to achieve your hiking goals, maybe I can create a course to help you, and all of our virtual trail sisters. I'm up for the challenge! Hiking For Her's hiking courses have one goal: To get more women onto trails! Ever wonder how "real" hikers prepare for a hike? And what do they do during it? and after? There are lots of hiking myths floating around about "real" hiking. MYTH: A statement that is wrongly believed to be true. You might not even notice that you've bought into these false statements thrown around by the media. Even worse, you might be letting them hold you back from quality (and maybe quantity) trail time! It's not in my nature to leave these hiking myths unchallenged. No hiker, newbie to trail hardened expert, deserves to be burdened by these untruths! Thus, I designed a free 5 day mini-course so we could to do a little myth busting. Over the next 3 days, I can share 3 of the most common hiking myths with you via email. Only you can decide if you're unconsciously laboring under the burden of one (or more) of them. But I won't leave it at that. Give me two more days, and I'll share 2 hiking habits I recommend to every hiker, with tips to get you started down the right trail (so to speak). You might already be displaying these “real hiker” traits! But if not, it's time to add them to your repertoire. In a nutshell, these free mini-lessons will hold up a mirror so you can recognize yourself as a real hiker (or a real hiker in training). What exactly does a “real” hiker look and act like? Am I a real hiker? Do I have good hiking habits? Sign up is free, fast, and will give me permission to send you one mini-lesson each day for the next 5 days. What happens once you sign up? The first “real hiker” myth will land in your inbox. Devote 5 minutes (probably much less) to reading it. Then think it over on your daily hike, walk, swim, bike ride, run or whatever gets you outside and moving. Five days X five minutes = less than half an hour, in less than a week, for the best hiking tips to make you a stronger hiker. I understand that you will use my information to send me the free e-course, and to send my free monthly Happy Trails newsletter. I can unsubscribe at any time using the provided link. If you'd like to start hiking but have some concerns and questions, why not try a short hike with an experienced trail guide and veteran teacher? 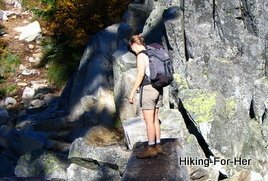 Read all about Seattle area in person hiking classes here. Note: These courses are unavailable right now because they are being revamped. Please check back, or send an email to be placed on the 2019 notification list. Is Solo Hiking For Me? Learners who are self motivated, with busy schedules. instructor contact info gives you lifetime access for posing questions and receiving answers. relies upon your own motivation and stamina to complete the course. Contact me to place your name on a notification list for new start dates in 2019.
have a definite hiking goal in mind. Read the course description here. Or visit the Hiking For Her Facebook page!